The Wall Street Journal recently published a great article about the importance of your LinkedIn profile picture. Your profile picture is instrumental in forging your online brand and identity. According to LinkedIn research, profiles with a profile picture are seven times more likely to be viewed than profiles without a profile picture. This is huge! Since your profile picture directly affects your profile’s open rate, rather than uploading an outdated photo of yourself taken at a wedding, why not approach the selection of your profile photo strategically? The image you upload should be of you in photographic form. No logos. No cartoons. No caricatures. The photo should capture you from the top of your head to the bottom of your tie knot or just below your chin or at your shoulders. NO CHEST! NO ELBOWS! Definitely NO KNEES! 2. Dress to reflect the norms of the profession that you’re in or hope to join. This reminds me of what my mom always said to me, “Don’t dress for the job you have, dress for the job you want!” If you are not sure what is acceptable for your industry, search through profiles of other people within your industry and take the lead from their profile photo. You can also imagine you are going to a client meeting or sitting down with your boss… what would you wear in those circumstances? That’s what to wear in your LinkedIn profile picture. 3. Choose a picture that conveys your energy and personality. Take this one with a grain of salt… you don’t want to come across as flaky or crazy. When in doubt, err to the side of conservative. LinkedIn is a professional social networking site. Social-media profiles are increasingly important in building your business identity. “It’s a hugely powerful branding tool—and you have to be very strategic about building it,” says Nicole Williams, connection director for LinkedIn. 4. Be aware of your posture! Sit up straight with your shoulders back. Make sure your eyes are opened and you have a smile on your face. Imagine a thread passing vertically through the top of your head and down through the center of your body. The thread gently pulls you up from the very top of your head. Feel your body fall into place. Posture communicates confidence and competency! Smiling makes you look approachable and well adjusted. Don’t be afraid to ask other people for their opinion on your photo if you are unsure how it portrays you. 5. Have your photo taken by a friend or someone who puts you at ease. I suggest getting a professionally taken photograph. It’s important to choose the right photographer, though. Make sure he or she puts you at ease and has a modern eye to this newfangled digital technology. If your photographer directs you to sit on a stool in front of a cloud background with your chin resting in your palm and your elbow balanced on your knee… RUN TO THE NEAREST EXIT! Your LinkedIn profile picture is an opportunity to show your best face to your audience. Don’t miss this chance! Think about it... your LinkedIn headline is the FIRST THING people see of your LinkedIn profile AND it should compel them to read more! 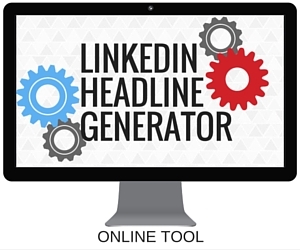 My LinkedIn Headline Generator is an online application that helps you create a POWERFUL, keyword-packed LinkedIn Headline! Choose your terms and in seconds you have an engaging, professional LinkedIn Headline that impresses!